Some of the first geological thoughts were about the origin of the Earth. Ancient Greece developed some primary geological concepts concerning the origin of the Earth. Additionally, in the 4th century BC Aristotle made critical observations of the slow rate of geological change. He observed the composition of the land and formulated a theory where the Earth changes at a slow rate and that these changes cannot be observed during one person's lifetime. Aristotle developed one of the first evidence-based concepts connected to the geological realm regarding the rate at which the Earth physically changes. Much later in the Roman period, Pliny the Elder produced a very extensive discussion of many more minerals and metals then widely used for practical ends. He was among the first to correctly identify the origin of amber as a fossilized resin from trees by the observation of insects trapped within some pieces. He also laid the basis of crystallography by recognising the octahedral habit of diamond. Ibn Sina (Avicenna, AD 981–1037), a Persian polymath, made significant contributions to geology and the natural sciences (which he called Attabieyat) along with other natural philosophers such as Ikhwan AI-Safa and many others. Ibn Sina wrote an encyclopaedic work entitled "Kitab al-Shifa" (the Book of Cure, Healing or Remedy from ignorance), in which Part 2, Section 5, contains his commentary on Aristotle's Mineralogy and Meteorology, in six chapters: Formation of mountains, The advantages of mountains in the formation of clouds; Sources of water; Origin of earthquakes; Formation of minerals; The diversity of earth's terrain. In medieval China, one of the most intriguing naturalists was Shen Kuo (1031–1095), a polymath personality who dabbled in many fields of study in his age. In terms of geology, Shen Kuo is one of the first naturalists to have formulated a theory of geomorphology. This was based on his observations of sedimentary uplift, soil erosion, deposition of silt, and marine fossils found in the Taihang Mountains, located hundreds of miles from the Pacific Ocean. He also formulated a theory of gradual climate change, after his observation of ancient petrified bamboos found in a preserved state underground near Yanzhou (modern Yan'an), in the dry northern climate of Shaanxi province. He formulated a hypothesis for the process of land formation: based on his observation of fossil shells in a geological stratum in a mountain hundreds of miles from the ocean, he inferred that the land was formed by erosion of the mountains and by deposition of silt. It was not until the 17th century that geology made great strides in its development. At this time, geology became its own entity in the world of natural science. It was discovered by the Christian world that different translations of the Bible contained different versions of the biblical text. The one entity that remained consistent through all of the interpretations was that the Deluge had formed the world's geology and geography. [not in citation given] To prove the Bible's authenticity, individuals felt the need to demonstrate with scientific evidence that the Great Flood had in fact occurred. With this enhanced desire for data came an increase in observations of the Earth's composition, which in turn led to the discovery of fossils. Although theories that resulted from the heightened interest in the Earth's composition were often manipulated to support the concept of the Deluge, a genuine outcome was a greater interest in the makeup of the Earth. Due to the strength of Christian beliefs during the 17th century, the theory of the origin of the Earth that was most widely accepted was A New Theory of the Earth published in 1696, by William Whiston. Whiston used Christian reasoning to "prove" that the Great Flood had occurred and that the flood had formed the rock strata of the Earth. From this increased interest in the nature of the Earth and its origin, came a heightened attention to minerals and other components of the Earth's crust. Moreover, the increasing economic importance of mining in Europe during the mid to late 18th century made the possession of accurate knowledge about ores and their natural distribution vital. Scholars began to study the makeup of the Earth in a systematic manner, with detailed comparisons and descriptions not only of the land itself, but of the semi-precious metals it contained, which had great commercial value. For example, in 1774 Abraham Gottlob Werner published the book Von den äusserlichen Kennzeichen der Fossilien (On the External Characters of Minerals), which brought him widespread recognition because he presented a detailed system for identifying specific minerals based on external characteristics. The more efficiently productive land for mining could be identified and the semi-precious metals could be found, the more money could be made. This drive for economic gain propelled geology into the limelight and made it a popular subject to pursue. With an increased number of people studying it, came more detailed observations and more information about the Earth. Also during the eighteenth century, aspects of the history of the Earth—namely the divergences between the accepted religious concept and factual evidence—once again became a popular topic for discussion in society. In 1749, the French naturalist Georges-Louis Leclerc, Comte de Buffon published his Histoire Naturelle, in which he attacked the popular Biblical accounts given by Whiston and other ecclesiastical theorists of the history of Earth. From experimentation with cooling globes, he found that the age of the Earth was not only 4,000 or 5,500 years as inferred from the Bible, but rather 75,000 years. Another individual who described the history of the Earth with reference to neither God nor the Bible was the philosopher Immanuel Kant, who published his Universal Natural History and Theory of the Heavens (Allgemeine Naturgeschichte und Theorie des Himmels) in 1755. From the works of these respected men, as well as others, it became acceptable by the mid eighteenth century to question the age of the Earth. This questioning represented a turning point in the study of the Earth. It was now possible to study the history of the Earth from a scientific perspective without religious preconceptions. With the application of scientific methods to the investigation of the Earth's history, the study of geology could become a distinct field of science. To begin with, the terminology and definition of what constituted geological study had to be worked out. The term "geology" was first used technically in publications by two Genevan naturalists, Jean-André Deluc and Horace-Bénédict de Saussure, though "geology" was not well received as a term until it was taken up in the very influential compendium, the Encyclopédie, published beginning in 1751 by Denis Diderot. Once the term was established to denote the study of the Earth and its history, geology slowly became more generally recognized as a distinct science that could be taught as a field of study at educational institutions. In 1741 the best-known institution in the field of natural history, the National Museum of Natural History in France, created the first teaching position designated specifically for geology. This was an important step in further promoting knowledge of geology as a science and in recognizing the value of widely disseminating such knowledge. By the 1770s, chemistry was starting to play a pivotal role in the theoretical foundation of geology and two opposite theories with committed followers emerged. These contrasting theories offered differing explanations of how the rock layers of the Earth's surface had formed. One suggested that a liquid inundation, perhaps like the biblical deluge, had created all geological strata. The theory extended chemical theories that had been developing since the seventeenth century and was promoted by Scotland's John Walker, Sweden's Johan Gottschalk Wallerius and Germany's Abraham Werner. Of these names, Werner's views become internationally influential around 1800. He argued that the Earth's layers, including basalt and granite, had formed as a precipitate from an ocean that covered the entire Earth. Werner's system was influential and those who accepted his theory were known as Diluvianists or Neptunists. The Neptunist thesis was the most popular during the late eighteenth century, especially for those who were chemically trained. However, another thesis slowly gained currency from the 1780s forward. Instead of water, some mid eighteenth-century naturalists such as Buffon had suggested that strata had been formed through heat (or fire). 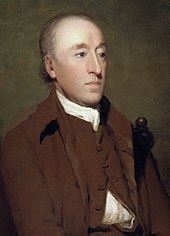 The thesis was modified and expanded by the Scottish naturalist James Hutton during the 1780s. He argued against the theory of Neptunism, proposing instead the theory of based on heat. Those who followed this thesis during the early nineteenth century referred to this view as Plutonism: the formation of the Earth through the gradual solidification of a molten mass at a slow rate by the same processes that had occurred throughout history and continued in the present day. This led him to the conclusion that the Earth was immeasurably old and could not possibly be explained within the limits of the chronology inferred from the Bible. Plutonists believed that volcanic processes were the chief agent in rock formation, not water from a Great Flood. In the early 19th century, the mining industry and Industrial Revolution stimulated the rapid development of the stratigraphic column - "the sequence of rock formations arranged according to their order of formation in time." 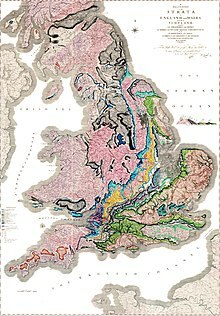 In England, the mining surveyor William Smith, starting in the 1790s, found empirically that fossils were a highly effective means of distinguishing between otherwise similar formations of the landscape as he travelled the country working on the canal system and produced the first geological map of Britain. At about the same time, the French comparative anatomist Georges Cuvier assisted by his colleague Alexandre Brogniart at the École des Mines de Paris realized that the relative ages of fossils could be determined from a geological standpoint; in terms of what layer of rock the fossils are located and the distance these layers of rock are from the surface of the Earth. Through the synthesis of their findings, Brogniart and Cuvier realized that different strata could be identified by fossil contents and thus each stratum could be assigned to a unique position in a sequence. After the publication of Cuvier and Brongniart's book, "Description Geologiques des Environs de Paris" in 1811, which outlined the concept, stratigraphy became very popular amongst geologists; many hoped to apply this concept to all the rocks of the Earth. During this century various geologists further refined and completed the stratigraphic column. For instance, in 1833 while Adam Sedgwick was mapping rocks that he had established were from the Cambrian Period, Charles Lyell was elsewhere suggesting a subdivision of the Tertiary Period; whilst Roderick Murchison, mapping into Wales from a different direction, was assigning the upper parts of Sedgwick's Cambrian to the lower parts of his own Silurian Period. The stratigraphic column was significant because it supplied a method to assign a relative age of these rocks by slotting them into different positions in their stratigraphical sequence. This created a global approach to dating the age of the Earth and allowed for further correlations to be drawn from similarities found in the makeup of the Earth's crust in various countries. In early nineteenth-century Britain, catastrophism was adapted with the aim of reconciling geological science with religious traditions of the biblical Great Flood. In the early 1820s English geologists including William Buckland and Adam Sedgwick interpreted "diluvial" deposits as the outcome of Noah's flood, but by the end of the decade they revised their opinions in favour of local inundations. Charles Lyell challenged catastrophism with the publication in 1830 of the first volume of his book Principles of Geology which presented a variety of geological evidence from England, France, Italy and Spain to prove Hutton's ideas of gradualism correct. He argued that most geological change had been very gradual in human history. Lyell provided evidence for Uniformitarianism; a geological doctrine that processes occur at the same rates in the present as they did in the past and account for all of the Earth's geological features. Lyell's works were popular and widely read, the concept of Uniformitarianism had taken a strong hold in geological society. During the same time that the stratigraphic column was being completed, imperialism drove several countries in the early to mid 19th century to explore distant lands to expand their empires. This gave naturalists the opportunity to collect data on these voyages. In 1831 Captain Robert FitzRoy, given charge of the coastal survey expedition of HMS Beagle, sought a suitable naturalist to examine the land and give geological advice. This fell to Charles Darwin, who had just completed his BA degree and had accompanied Sedgwick on a two-week Welsh mapping expedition after taking his Spring course on geology. Fitzroy gave Darwin Lyell's Principles of Geology, and Darwin became Lyell's first disciple, inventively theorising on uniformitarian principles about the geological processes he saw, and challenging some of Lyell's ideas. He speculated about the Earth expanding to explain uplift, then on the basis of the idea that ocean areas sank as land was uplifted, theorised that coral atolls grew from fringing coral reefs round sinking volcanic islands. This idea was confirmed when the Beagle surveyed the Cocos (Keeling) Islands, and in 1842 he published his theory on The Structure and Distribution of Coral Reefs. Darwin's discovery of giant fossils helped to establish his reputation as a geologist, and his theorising about the causes of their extinction led to his theory of evolution by natural selection published in On the Origin of Species in 1859. Economic motivations for the practical use of geological data caused governments to support geological research. During the 19th century the governments of several countries including Canada, Australia, Great Britain and the United States funded geological surveying that would produce geological maps of vast areas of the countries. Geological surveying provides the location of useful minerals and such information could be used to benefit the country's mining industry. With the government funding of geological research, more individuals could study geology with better technology and techniques, leading to the expansion of the field of geology. In the 19th century, scientific inquiry had estimated the Age of the Earth in terms of millions of years. By the early 20th Century radiogenic isotopes had been discovered and Radiometric Dating had been developed. In 1911 Arthur Holmes dated a sample from Ceylon at 1.6 billion years old using lead isotopes. In 1921, attendees at the yearly meeting of the British Association for the Advancement of Science came to a rough consensus that the Age of the Earth was a few billion years old, and that radiometric dating was credible. Holmes published The Age of the Earth, an Introduction to Geological Ideas in 1927 in which he presented a range of 1.6 to 3.0 billion years. Subsequent dating has taken the Age of the Earth to around 4.55 billion years. Theories that did not comply with the scientific evidence that established the age of the Earth could no longer be accepted. In 1862, the physicist William Thomson, 1st Baron Kelvin, published calculations that fixed the age of Earth at between 20 million and 400 million years. He assumed that Earth had formed as a completely molten object, and determined the amount of time it would take for the near-surface to cool to its present temperature. With the discovery of radioactive decay the age of the Earth was pushed back even further. Arthur Holmes, was a pioneer of geochronology. In 1913 Holmes was on the staff of Imperial College, when he published his famous book The Age of the Earth in which he argued strongly in favour of the use of radioactive dating methods rather than methods based on geological sedimentation or cooling of the earth (many people still clung to Lord Kelvin's calculations of less than 100 million years). Holmes estimated the oldest Archean rocks to be 1,600 million years, but did not speculate about the Earth's age. By this time the discovery of isotopes had complicated the calculations and he spent the next years grappling with these. His promotion of the theory over the next decades earned him the nickname of Father of Modern Geochronology. By 1927 he had revised this figure to 3,000 million years and in the 1940s to 4,500±100 million years, based on measurements of the relative abundance of uranium isotopes established by Alfred O. C. Nier. The general method is now known as the Holmes-Houterman model after Fritz Houtermans who published in the same year, 1946. The established age of the Earth has been refined since then but has not significantly changed. In 1912 Alfred Wegener proposed the theory of Continental Drift. This theory suggests that the shapes of continents and matching coastline geology between some continents indicates they were joined together in the past and formed a single landmass known as Pangaea; thereafter they separated and drifted like rafts over the ocean floor, currently reaching their present position. Additionally, the theory of continental drift offered a possible explanation as to the formation of mountains; Plate Tectonics built on the theory of continental drift. Unfortunately, Wegener provided no convincing mechanism for this drift, and his ideas were not generally accepted during his lifetime. Arthur Homes accepted Wegener's theory and provided a mechanism: mantle convection, to cause the continents to move. However, it was not until after the Second World War that new evidence started to accumulate that supported continental drift. There followed a period of 20 extremely exciting years where the Theory of Continental Drift developed from being believed by a few to being the cornerstone of modern Geology. Beginning in 1947 research found new evidence about the ocean floor, and in 1960 Bruce C. Heezen published the concept of mid-ocean ridges.Soon after this, Robert S. Dietz and Harry H. Hess proposed that the oceanic crust forms as the seafloor spreads apart along mid-ocean ridges in seafloor spreading. This was seen as confirmation of mantle convection and so the major stumbling block to the theory was removed. Geophysical evidence suggested lateral motion of continents and that oceanic crust is younger than continental crust. This geophysical evidence also spurred the hypothesis of paleomagnetism, the record of the orientation of the Earth's magnetic field recorded in magnetic minerals. British geophysicist S. K. Runcorn suggested the concept of paleomagnetism from his finding that the continents had moved relative to the Earth's magnetic poles. Tuzo Wilson, who was a promoter of the sea floor spreading hypothesis and continental drift from the very beginning, added the concept of transform faults to the model, completing the classes of fault types necessary to make the mobility of the plates on the globe function. A symposium on continental drift was held at the Royal Society of London in 1965 must be regarded as the official start of the acceptance of plate tectonics by the scientific community.The abstracts from the symposium are issued as Blacket, Bullard, Runcorn;1965.In this symposium, Edward Bullard and co-workers showed with a computer calculation how the continents along both sides of the Atlantic would best fit to close the ocean, which became known as the famous "Bullard's Fit". By the late 1960s the weight of the evidence available saw Continental Drift as the generally accepted theory. ^ Asimov, M. S.; Bosworth, Clifford Edmund (eds.). The Age of Achievement: A.D. 750 to the End of the Fifteenth Century: The Achievements. History of civilizations of Central Asia. pp. 211–14. ISBN 978-92-3-102719-2. ^ Eddy, Matthew Daniel (2008). The Language of Mineralogy: John Walker, Chemistry and the Edinburgh Medical School. Ashgate. ^ Dalrymple, G. Brent (1994). The Age of the Earth. Stanford University Press. p. 74. ISBN 0-8047-2331-1. ^ England, P; Molnar, P (2007). "John Perry's neglected critique of Kelvin's age for the Earth: A missed opportunity in geodynamics". GSA Today. 17 (1). ^ Dalrymple, G. Brent (1994). The Age Of The Earth. Stanford University Press. pp. 14–17, 38. ISBN 0-8047-2331-1. ^ Holmes, Arthur (1913). The Age of the Earth. London: Harper. p. 18. ^ Dalrymple, G.Brent (2004). Ancient Earth, Ancient Skies: The Age of Earth and Its Cosmic Surroundings. Stanford University Press. p. 52. ISBN 0804749337. ^ Wegener, Alfred (1912). "Die Herausbildung der Grossformen der Erdrinde (Kontinente und Ozeane), auf geophysikalischer Grundlage" (PDF)". Petermanns Geographische Mitteilungen. 63: 185–95, 253–56, 305–09. ^ Holmes, Arthur (1931). "Radioactivity and Earth Movements" (PDF). Transactions of the Geological Society of Glasgow. Geological Society of Glasgow: 559–606. ^ Hess, H. H. (1 November 1962). "History of Ocean Basins" (PDF). In A. E. J. Engel; Harold L. James; B. F. Leonard (eds.). Petrologic studies: a volume in honor of A. F. Buddington. Boulder, CO: Geological Society of America. pp. 599–620. ^ Wilson, J.T> (1963). "Hypothesis on the Earth's behaviour". Nature. 198 (4884): 849–65. Bibcode:1963Natur.198..849H. doi:10.1038/198849a0. ^ Wilson, J. Tuzo (1965). "A new class of faults and their bearing on continental drift". Nature. 207 (4995): 343–47. Bibcode:1965Natur.207..343W. doi:10.1038/207343a0. ^ Blacket, P.M.S. ; Bullard, E.; Runcorn, S.K., eds. (1965). "A Symposium on Continental Drift, held on 28 October 1965". Philosophical Transactions of the Royal Society A. 258 (1088). Royal Society of London. Burek, C.V.; Higgs, B., eds. (2007). The Role of Women in the History of Geology: Special Publication no 281. London, England: Geological Society of London. ISBN 978-1862392274. Leddra, Michael (2010). Time matters : geology's legacy to scientific thought. Chichester: Wiley. ISBN 978-1-4051-9908-7. O'Hara, Kieran D. (2018). A Brief History of Geology. Cambridge, England: Cambridge University Press.